"The install went good, cameras are functioning good, your crew is very knowledgeable in the field and we are pleased with Reed security. There are a lot of companies in the security business I am sure, but it is your commitment to the customer and service that you provide is where Reed security really shines. If any potential customer wants to call me they can." 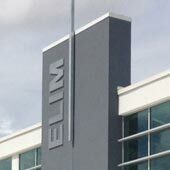 Elim Church recently opened their multi-million dollar state-of-the-art facility at 419 Slimmon Road. We consulted with Administration Pastor Kevin Abrey and designed a custom security solution to protect the staff, visitors, and the building. We installed layered security consisting of an Alarm System with Burglar and Fire protection. Elim Church staff are notified of any events by Reed's 24/7 Rapid Response Monitoring Stations. An Access Control Swipe Card system restricts access to perimeter and interior doors and a ReedHD Hi-Def Video Surveillance system captures activities at entrance ways and parking lots. We worked with the contractor (Quorex Construction) and the electricians (Aim Electric) to ensure the security project was successful and completed on time. To see photos follow the link below.